In September 2018, a number of cycling routes connecting to campus will be completed and available for use. These include John Hindle Drive connecting to Glenmore Road to the west, The Okanagan Rail Trail connecting to the Kelowna Airport to the north and downtown to the south, and the Acland Road / Bulman Road / Highway 97 underpass connecting to Rutland to the east. 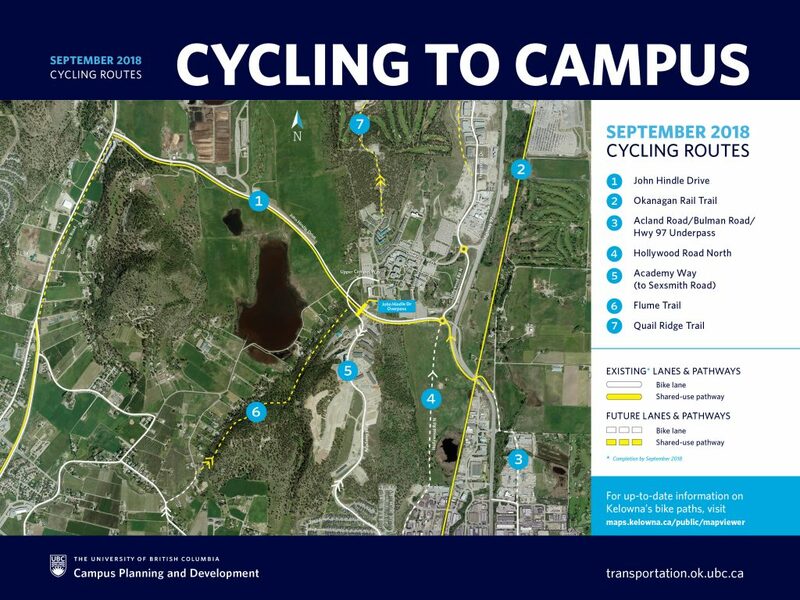 The following is a map of cycling routes to campus available in September 2018, as well as planned future routes. The City of Kelowna is responsible for cycling facilities in Kelowna. To find cycling routes in Kelowna, see the City’s Mapviewer. Cycling is easy on campus with bike lanes along UBC’s roadways, and bike racks, bike lockers and end-of-trip facilities conveniently located throughout the campus. With the opening of new bike access routes to and from campus this September, the number of cyclists is expected to increase and the university is implementing a significant increase in the number of bike racks and lockers available throughout campus. Bike racks are located outside most campus academic buildings and residences. Outdoor bike lockers are located at the Reichwald Health Sciences Centre, Arts and Sciences II, Science building, Gymnasium, Library and Administration buildings. 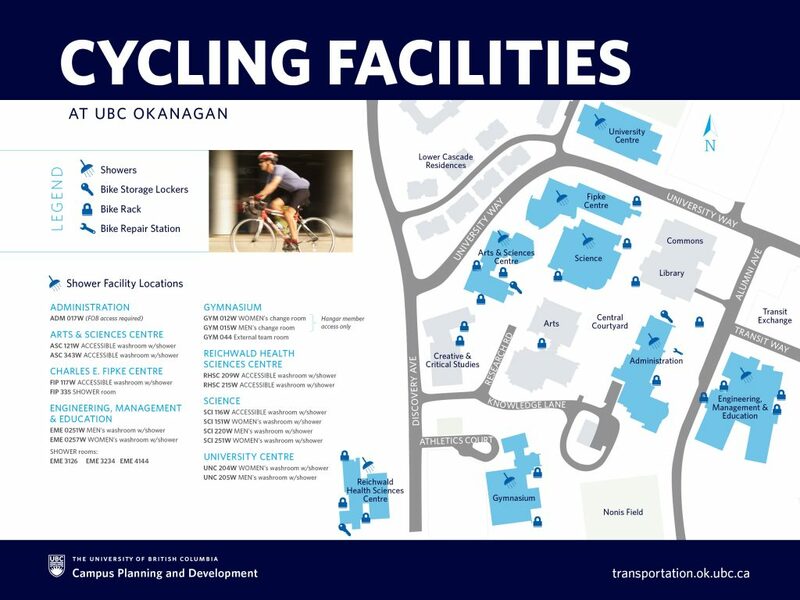 Bike rack and outdoor bike storage locker locations can be found on UBC’s online Campus Map. Avoid parking in areas other than bike racks, as your bike could be removed without warning and at your own risk and expense. If you would like to rent a bike storage locker, contact Parking Services (250.807.8554 or okanagan.parking@ubc.ca) for more information. Note, storage lockers are available on a first-come, first-serve basis. Indoor bike storage and lockers are available through the UBCycles program. End-of-trip facilities for cyclists – showers and change rooms – are located in many of the campus’s buildings. Most are publicly accessible. A few require Salto Access (FOB), which can be arranged by contacting Campus Security. You don’t need to own a bike to cycle on campus. You can participate in a bike loan program through UBCycles, which offers both short- and long-term bike loans on campus. UBCycles is a primarily student-run program dedicated to providing a hub for biking activities on the UBC Okanagan campus. It also provides opportunities to learn about bike repair and provides access to bike repair tools with membership.